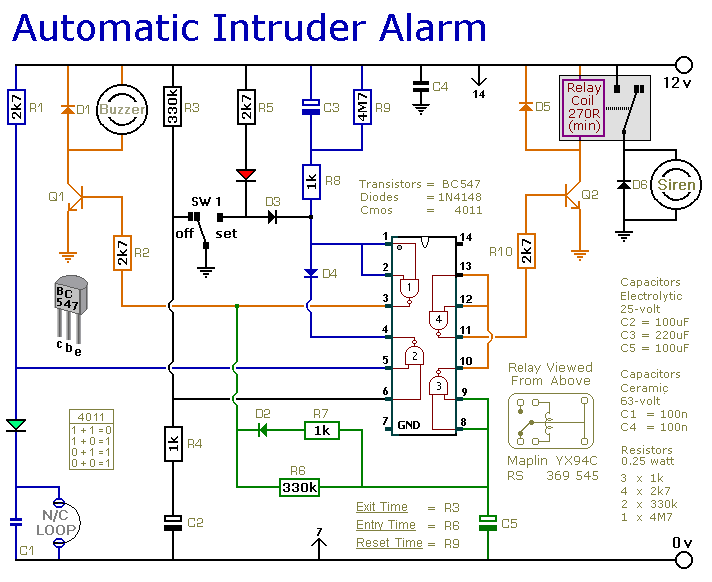 This is a simple single-zone burglar alarm circuit. Its features include automatic Exit and Entry delays and a timed Bell/Siren Cut-Off. It's designed to be used with the usual types of normally-closed input devices such as - magnetic reed contacts - micro switches - foil tape - and PIRs. But it can be Easily Modified to accept normally-open triggering devices - such as pressure mats. It's easy to use. First check that the building is secure and that the green LED is lit. Then move SW1 to the "set" position. The red LED will light. You now have about 30 seconds to leave the building. When you return and open the door - the Buzzer will sound. You then have about 30 seconds to move SW1 to the "off" position. If you fail to do so - the relay will energize and the Siren will sound. While at least one of the switches in the normally-closed loop remains open - the Siren will continue to sound. However, about 15-minutes after the loop has been restored - the relay will de-energize - the Siren will Cut-Off - and the alarm will Reset. Of course, you can turn the Siren off at any time by moving SW1 to the "off" position. Because of manufacturing tolerances - the precise length of any delay depends on the characteristics of the actual components you've used in your circuit. But by altering the values of R3, R6 & R9 you can adjust the Exit, Entry and Bell Cut-Off times to suit your requirements. Increasing the values increases the time - and vice-versa. 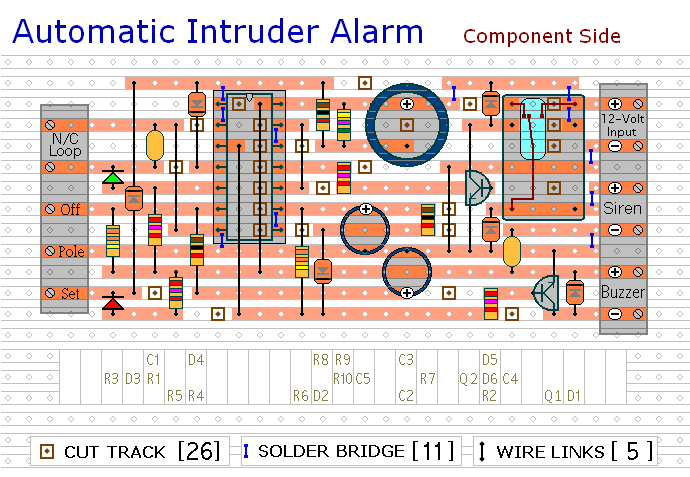 The Support material for this alarm includes a complete circuit description - a parts list - a step-by-step guide to construction - and more. its good. i want to operate ac relay(HJR-3FF-S-Z) using 5v microcontroller (ATMEGA16) output. how can i do this. plz give some simple ckt design. thnx.